Defence giant BAE Systems is to make a joint bid with the UK's largest shipbuilder Cammell Laird to construct five low-cost warships. It follows the announcement in September of a new national shipbuilding strategy intended to benefit UK shipyards. The Ministry of Defence plans to boost a depleted Royal Navy fleet with five Type 31e frigates, costing £250m each. BAE recently revealed plans to cut almost 2,000 mainly air sector jobs. The defence firm is facing an order gap for the Eurofighter Typhoon and wants to slow production in its air sector. 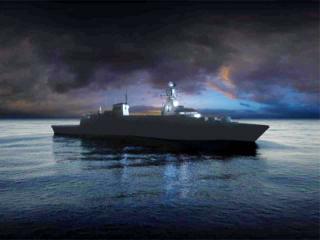 The navy currently uses Type 23 frigates, which would be slowly phased out. The contract for the new Type 31e General Purpose frigates is expected to be awarded in spring 2019, with construction beginning in the autumn. A successful bid would see Merseyside-based Cammell Laird act as prime contractor. The MoD's shipbuilding strategy was formed in response to Sir John Parker's independent report into British naval shipbuilding. The report made recommendations to transform the UK maritime industry and boost the prosperity of regions, shipyards and maritime supply chains across the country. Cammell Laird has previously worked alongside BAE Systems in constructing 1200-tonne flight deck blocks for the Queen Elizabeth Class aircraft carriers, and blocks for the complex nuclear powered Astute submarines. Chief Executive Officer John Syvret said: "The company is proposing an innovative frigate design known as Leander, based on existing and proven BAE systems naval ship designs. "This design meets the T31e requirements with a high level of adaptability to attract the widest range of international customers." "We believe our expertise in warship design and engineering capability, combat management systems and export campaigns, together with Cammell Laird, means we are in an excellent position to contribute to the success of the Type 31e programme"
Located in Birkenhead on the River Mersey, it has a long history in constructing some of the most iconic Royal Navy warships, including HMS Achilles and HMS Ajax. The Merseyside shipbuilder is currently building the £150m new arctic survey vessel, RSS Sir David Attenborough.